It seems appropriate that I end this month with my follow-up post on the Hindi music industry's eccentric genius. 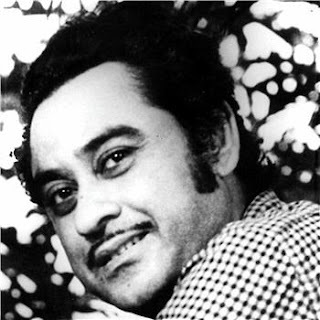 It's been a long, and forced, sabbatical from the blog for me; so, if it weren't for the fact that the more I read about Kishore Kumar, the more fascinated I became by the enigma he was, I would never have succumbed to blogging so soon. Kishore Kumar was a paradox - he has been called a 'crackpot', a 'mad genius', 'stingy', 'avaricious', 'money-minded'. Yet, there are equally strong testimonials to his generosity, his open-handedness, and his affection overriding his need to be paid. He did however expect those who could afford it to pay him his dues, and part of his insistence on being paid before the shoot or the recording was precisely because they wouldn't do so. In an interview after Kishore Kumar's death, his brother Ashok Kumar narrated an incident that happened on the sets of Bhai Bhai. Kishore had not been paid even though the shooting was almost over. When he refused to shoot his remaining scenes, the producer asked Ashok Kumar to convince Kishore to shoot. In deference to his elder brother's wishes, Kishore applied make-up. When the shoot began however, instead of walking from one door to another as the shot demanded, Kishore Kumar somersaulted once, saying 'Rs 5000'. Then he somersaulted again - 'Rs 10,000'. By the fourth somersault, he had reached the entrance, quickly stood up, and waved good-bye to everyone present. He knew he wasn't going to be paid that day. The paradoxes do not end there - Kishore was a man who became famous for his yodelling, and his comic roles; yet, if you looked at the films he directed, you saw a director with an eye for the unusual, and a composer of such subtle melodies as Aa chal ke tujhe and Koi humdum na raha. His sensitive handling of rather serious subjects saw him even direct a songless film (Door Wadiyon Mein Kahin). In my earlier post on the much-misunderstood (and he worked to keep it that way) singer, I focused on his solo songs. In this, I reference a few of my favourite duets. As always, it is a very subjective list, and one that is subject to change depending on mood and occasion. This is one of the earliest Lata-Kishore duets, and one that is not usually heard. It has been a personal favourite for many years now. Lata Mangeshkar and Kishore Kumar shared an endearing relationship; he was the elder by 20 days, and so she referred to him as 'Kishoreda'. She was his senior in the profession, so out of courtesy to her, he charged one rupee less than she did. Their meeting was the stuff of which films are made. Lata Mangeshkar used to travel from Grant Road to Malad by train. One day, a young man got into the same compartment at Bombay Central, and got off at Malad with her. She used to either walk to Bombay Talkies or take a tonga; that day, she decided to do the latter. She was a bit flustered to see the young man follow her in another tonga right into the studio. She quickly went up to tell music director Khemchand Prakash about the lad; he looked up, and laughed. And the two were introduced. 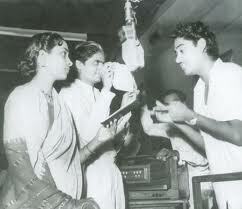 Kishore Kumar had already recorded Marne ki duaen kyun maangoon for Ziddi under Khemchand Prakash's baton; that day, he recorded his first ever duet with Lata Mangeshkar for the same film: Yeh kaun aaya re karke sola singar. 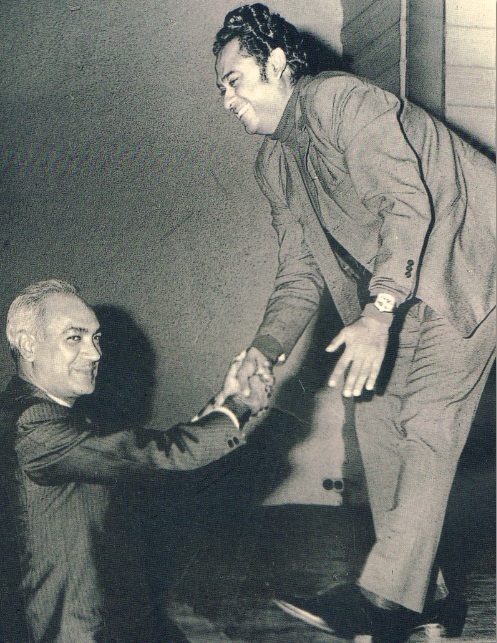 Lata and Kishore shared a mutual respect, affection and admiration; however, when he was awarded the Madhya Pradesh Government Cultural Award for Music (the first popular singer to be so honoured), he was aghast when, by the time he actually received the award, it had been renamed the Lata Mangeshkar Award. In an interview given a long time ago, Asha Bhosle had narrated how she struggled to find the right expression while singing the mukhda of this song. Burmanda told her to imagine her husband standing behind her, tugging at her sari. As they commenced the recording, suddenly, she was startled to find her pallu pulled. Spontaneously, she burst out, 'ah' but retained enough composure to continue with the line. When she turned around, she found Kishore Kumar grinning at her as the following lines, no whit discomposed by her reaction to his prank. 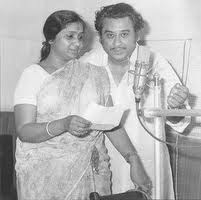 Listen to Asha Bhosle remembering certain incidents (it also helps that it is also one of my favourite Asha-Kishore duets) here. As I mentioned before, it is strange that the fans of Mohammed Rafi and Kishore Kumar are at loggerheads when the two singers themselves got on like a house on fire. Not many know that Mohammed Rafi sang for free for Kishore Kumar's directorial debut, or that Kishoreda himself considered Rafi a far better singer than himself. The warmth in their relationship was such that when Kishoreda's songs were banned on the radio during the Emergency (he had a falling out with Sanjay Gandhi because he had refused to sing for a Congress rally), it was Mohammed Rafi, along with music director Kalyanji, who fought his cause at the Centre, even offering to do stage shows for his colleague. It was a friendship that only ended with Rafisaab's death. Kishoreda sat for hours, blank-faced and heartbroken at Rafisaab's funeral - soon thereafter, he was to pay rich tribute to his friend, competitor (never rival), and senior with She jano amar pashe ajo - a haunting Bengali number. His first stage show after Mohammed Rafi's death was dedicated to his friend, and he began the programme with a sincere tribute. You can listen to the clip here. In an interview with IBN Live, Manna Dey narrated how the song came to be. When Manna Dey reached RD Burman's music room to record the song, he was surprised that Kishore Kumar was absent. Soon enough, he had a phone call from Kishore, asking him to come home, because Kishore's mother had made luchchis, rosogollas and aloo dum especially for Manna Dey. So off they trooped from RD's house to Kishore's house so they could eat. When it came to the recording, Manna Dey was reportedly upset that a classically trained singer like him had to lose, albeit on-screen, to an untrained singer like Kishore, but the unassuming man that he was, quietly did his best and left. 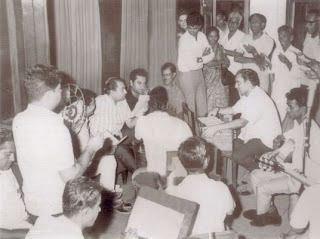 In his autobiography, Memories Come Alive, Manna Dey had this to say: "(Kishore) ...had a unique and unaffected style of singing which tended to eclipse the subtleties of classical music and place his singing partner, in a duet, at a disadvantage... For the two of us, the session had taken the magnitude of a duel. It took us 12 hours to complete it, and I must admit, Kishore was in his element that day. Out of this tough battle to outshine one another, would emerge a new star in the world of music." It was this song that reduced Mohammed Rafi to tears when he heard it, so overcome was he by Kishoreda's singing. Kishoreda only sang 13 songs with Geeta Dutt, but each one of them was a gem. This song is a particular favourite, full of pep and verve, for Geeta Bali and Dev Anand on screen. There is an element of mischief in the song, and teasing, and a mild flirtation. Equally memorable is an earlier number by the two of them, the pathos-ridden conversational O bewafa ye to bataa loota chaman kyun pyar ka from Pyar (1950), where the lyrics almost take on a reproachful tone, as each blames the other for the breakdown of the relationship. This song is unusual, in that Kishore is singing for Raj Kapoor, and it is one of the rare RK films (acted, produced or directed) that had SD Burman as the music director. I know it is a comic song, but it is sheer genius. Salilda had never thought much of Kishore's singing skills and in fact, had to be coerced into allowing Kishore to sing for himself in Naukri (Hemant Kumar was originally supposed to sing Chotasa ghar hoga.) For Half-Ticket, the song was originally meant to be a duet with Lata Mangeshkar. She was away at the time of the recording, and Kishore Kumar begged to be allowed to sing both parts, arguing that he was playing the 'female' onscreen. Reluctantly, Salilda gave in, with one caveat - Kishore had to prove he could do it. Kishoreda promptly sang the song, switching between female and male voice with ease. The rest, as they say, is history. (The song was recorded in a single take.) You can hear Salilda talk about the making of the song - here (the first 30 seconds or so). This is beyond my usual period for songs - I tend to stick to the first three decades - but I love Salilda's score in this film. The sarcasm in Gulzar's lyrics, its lightness only underscoring the seriousness of the situation, the youthfulness of the score, and a fantastic jugalbandi between the singers makes this an unforgettable song, and quite one of my favourites. This song had to be included for two reasons - one, it is one of my favourite numbers from the film (Ek ladki bheegi bhaagi si and Haal kaisa hai janab ka are the other numbers I particularly like); two, this song is vintage Kishore Kumar. Considering that, in real life, he once locked his doors and did not even allow his beloved eldest brother in, it is no surprise that he should torment his reel brother (real-life brother Anoop Kumar) with tales of what happened when a gorgeous Madhubala spent the night at the garage. If I wanted, I could have come up with a favourite Asha-Kishore list, or a Lata-Kishore one. It takes me more time to decide what to drop than to decide what to include. In this case, I must say I also went for the rarer compositions in some cases; the reasons for my choices are not so much the popularity of the songs as what appealed to me at the moment I was writing this post. Like all my lists, they are not static choices, but change as and when the mood strikes. Which songs would you add to my list? And why? *The source for this quote is contradictory, and I explained why in my post on Shamshad Begum. *I have endeavoured to give credit for the photographs I have sourced from the web, but have no way of knowing whether that is the original website or not. If not, and you know differently, please do drop me a line. I shall make the necessary corrections. Hemant Kumar actually recorded "Chota sa ghar hoga" for the film. It was never included in the film and it is quite short. Again like a typical Salilda song the backing music is lovely..
"On the occasion of the singer's 80th death anniversary, Nandy wrote a moving"
You can delte the comment after correction. A fitting tribute to Kishore and his song-partners, Anu! aa mohabbat ki basti has him in his Saigal mode, eh? Beautiful song! The anecdote to the chhod do aanchal was knew for me! Thanks for the Rafi tribute! Very touching! Javed Akhtar also relates in his show how Kishore always defended Rafi in different controversies. A unique rendition of man re kahe na dheer! ek chatur naar had Manna surely at a disadvantage, mainly because the character he sings for loses the duell and not Manna Dey! For me there were no losers, only winners! What? Kishore sang only 13 songs with Geeta Dutt? That sounds small, but one forgets that when Geeta's career was in full swing, Kishore sang only for himself and till the point where he started to lend his voice for others she wasn't getting any offers to sing for Hindi films. I had been searching for o bewafa ye to bata for so long! Thanks for supplying it! aake siddhi lagi is my fav funny song, I think! Kishore and Mukesh, an odd combo, eh? yeh sama ham tum jawam is anothe rexample of his lending voice for other heroes than Dev in the 50s! Which songs I would include? chattri na khol ud jayegi his duet with the third Mangeshkar sister, because it is so full of innocent mischief! Anu, you surpass yourself. What a delightful post! And, as before, the anecdotes ne toh chaar chaand lagaa diye. I knew the one about Piya piya piya mera jiya pukaare, but not the Chhod do aanchal or the Aake seedhi lagi one - the latter, especially, was a joy to hear Salil Choudhary recount! It's impossible for me to say which duets of Kishore I particularly like - as you say, it would be possible to come up with lists for just Kishore-Lata or Kishore-Asha! So many lovely songs, there. He did? Thanks for that clip. I'd never heard that before. *Clutching head in despair and scurrying off to make amends* Thanks, Harvey! Mohabbat ke basti mein is definitely Kishore in his Saigal mode. The Rafi tribute was very touching indeed. 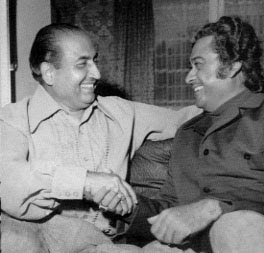 Mohammed Rafi's son once recounted how close his father and Kishore truly were. Kishore and Geeta - that is the information I could find, and that count seems to include their Bengali renditions for SD Burman. 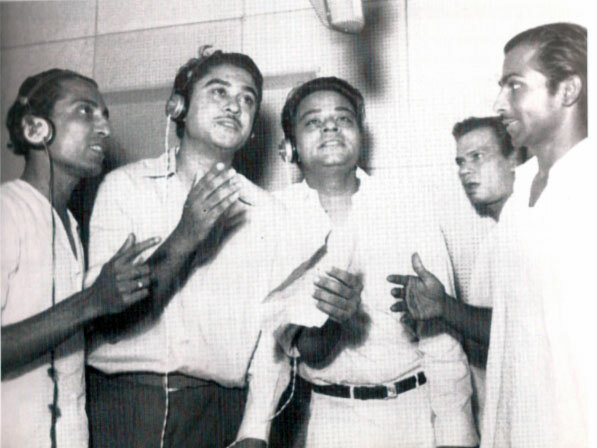 Kishore and Mukesh are definitely an odd combination, but it worked so well in that song. The Begunaah song was on my shortlist. Did you know that Begunaah is probably the only film that was banned ten days after its release, and its prints ordered destroyed? It was apparently inspired by a film called Knock on Wood, and its English producers filed suit. The Indian court resolved the case in their favour. Thank you, Madhu! I like the title song of Chalti ka Naam Gaadi too. :) The song from Girlfriend was new to me. I liked its slow lilt. Thanks for the clip. I'd read about Begunaah on some blog. It was I think also the only film which featured Jaikishan as an actor. The female part is giggly and whispery in chatri na khol? I don't think so, but we can agree to disagree. How did you find do pardesi anjaane se from Kashish? Neither had I. He makes it a very sweet, gentle song, whereas Kishore's version is sweet, but more peppy and playful. Thank you for that, SSW! By covering a wide array of singers for Kisore's duets, Kisore's singing persona has been given a very fullsome tribute. The add-on inputs have futher enriched by chipping in Suman Klayan pur and several other, otherwise prominent singers of that era - the era before KK shot to meteoric popularity in Rajesh Khanna era. A duet with Aarti Mukherjee from the 70's with music by Ravindra Jain and lyrics by M G Hashmat, the film is Tapasya. I have this vague recollection of the song being played on Vividh Bharati over and over again when I was coming back from school in the afternoons. Simple melody with a nice string arrangement. . In my opinion Rajshri songs suffered from a sameness in the 70's, you could always make out the typical sound maybe because they used Ravindra Jain all the time. He was a good composer melodically and some of his arrangements were really good but they seemed to have a sameness except when he went light classical as in Chitchor etc. Thanks for writing this post - a whole lot of interesting tidbits! Thank you, Shalini. 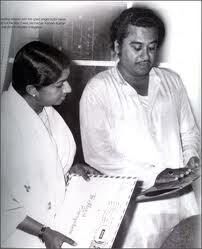 Kishore seems to have sung the maximum number of duets with Asha, followed by Lata, and Rafi. The Talat-Kishore duet you listed was on my shortlist. Thank you for linking to that in the comments. I didn't deliberately keep to the pre-Rajesh Khanna era, but even I'm suprised that my shortlist did not include one from that combination. There were so many songs to choose from from the previous periods. Ashokji, my parameters are quite fluid; though I usually stick to the earlier era, a few songs from the more 'modern' period will definitely sneak in. Thank you for that clip, it was Kishoreda's own composition too. :)Much like their subject matter, too. The songs made for some pleasant listening though. The film was good, too. Thank you, Neha. I'm alive. :) I cannot agree more about the Rafi-Kishore debate. How can you claim to like 'music' and then fight over which singer is better than the other? Maybe Kishore sang one song better, maybe only Rafi could have sung another one.... I look at it this way - the more songs the two of them sang, the more beautiful songs were recorded for posterity. I do wish the hateful comments would stop, though. Oh noooo! I am late for the celebrations. Not happy (: . Anyways, since everything has already been already said so I`ll leave with few more duets.. I'm not a great fan of Sharda, unfortunately, though the song from Naina reminded me of a Malayalam song. I liked the Annadata song, but then I have a soft corner for Salilda. :) Thanks for the additions. I was listening to a Meena Kapoor song from Adikaar(http://www.youtube.com/watch?v=dSo7b6wMPHw) in which Kishore da was an actor and got mixed up. As for Naina, all I remember is it being an unofficial Rebecca adaptation with some nice songs. I haven`t heard the Malayalam song but at least to me most of the Shankar`s western songs especially in post Jaikishen/ post 65 era sounded repetitive or based on stock SJ music with Jazz influence, saxophone and Sharda. Nra, S-J were very repetitive in their later years, anyway, and post-Jaikishen, there truly was a deterioration in quality. Their estrangement did not help much either. The Meena Kapoor song you have posted is a female solo - that was not an oversight, was it? Totally agree with you about Salilda! :) I don't know if you have seen this before, but I did a post on Salilda a long time ago. Wonderful post, learnt a lot (but that is expected from you) !!! I thought I would not be able to come up with any other combo, but here is one that has RDB singing for Amitabh & Kishore singing for Randhir. Interesting to see Kishore playing second fiddle to RDB, apparently happened due a tiff between Amitabh & Kishore --- I am sure you can further elaborate. Also, you can see Dev's two 70's discoveries together for the first time. I loved your post on Salilda, in fact my search for more on Salida brought me to your blog. So, more thanks to him. Since I love what little I've heard of the Geeta-Kishore combo and wish there were more duets by the two, here's a favorite from "Shararat." I don't think Kishore-Shamshad has been mentioned, but I absolutely love "meri neendon mein tum" from Naya Andaz. And lastly, a Kishore-Bhupendra duet from Double Cross. I like this ode to friendship much better than the more famous "yeh dosti ham nahi chhodenge." Samir, thank you. I tend to blank out Mahaan from my mind, so this song was not anywhere in my consciousness. :) The Kishore-Amitabh misunderstanding, from what I remember, is because Amitabh didn't have the dates to do a guest appearance in Mamta ki Chaaon Mein. This was not one of RD's better attempts, no? Thank you for the nice words about my Salilda post. :) No, the next post won't be a month away (hoepfully!). The Double Cross song is new to me. Come to think of it, even the film is new to me - is that two Vijay Anands I saw? I'll pass on this one - Yeh dosti is a darn sight better (in my opinion). I liked the Shararat song because it had a very different 'feel' to it. Thanks for the link. Wonderful post Anu, and you have put in some of my greatest favourites. I would also start any KK duet with Aa mohabbat ki basti basayenge hum. Thank you, AK. I'm glad you enjoyed your favourites all over again. A man who can marry four times over is indeed someone special and unique !